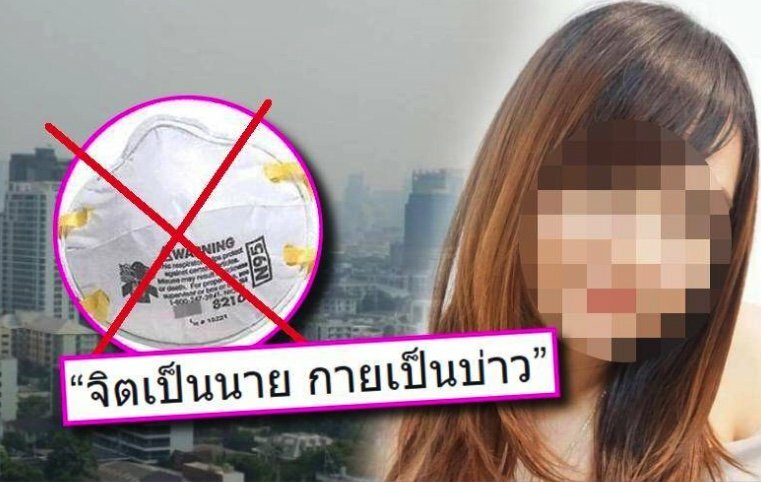 A leading online female “Life Coach” has suggested that wearing masks to combat the dangerous particles in Bangkok’s air is a waste of time and might even be harmful. Instead people should be concentrating on mind over matter. The woman – who was not named – has 72,000 followers online but was not available for comment when Daily News Online called. She had since taken down her post but screen captures were used in the Thai media as comment on the issue spread across Thai social media. The “Life Coach” said that people who wore masks were likely to bring stress on themselves and that coupled with an increased risk from lack of oxygen could cause more harm than good. She said that a university study she had helped with showed that people who wore masks were inherently worried about their health and the stress made it worse. The cause for many respiratory problems in the survey were not environmental factors such as air pollution but alcohol use and cigarette smoking, she concluded. She used a Thai proverb “Jit pen nai, gai pen bao” that roughly equates to the English term about using mind over matter or which suggests that by not worrying about something, it won’t harm you. Her comments caused much debate online as many people believe that the problem causing 2.5 micron particulate matter can be filtered out by the use of masks.